Do you plan on visiting our Postgraduate Open Day on Wednesday 27 March from 2:30pm – 6:00pm? You’ll get more out of your visit if you arrive prepared, so today we’re sharing our tips on how to get the most out of your Postgraduate Open Day visit! Find out where the university is and how to get there. It may seem obvious, but travelling to the university is something you shouldn’t have to worry about on the day. Check train times, available travel options and how long it will take to get there. Plan ahead. Get a feel for the layout of the campus, check out courses you’re interested in online, get a rough plan for the afternoon, book anything you need to in advance, and write down all the questions you want to ask on the day. 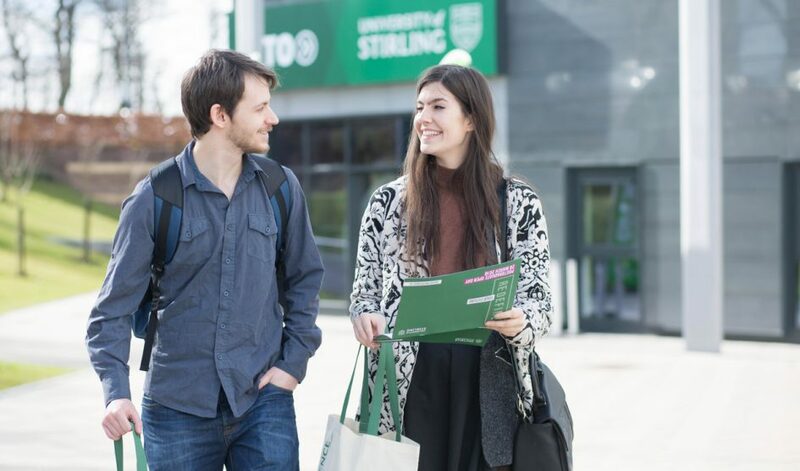 Did you know that, at the University of Stirling, staff from the Admissions Team will be available on the day to offer advice and guidance around entry requirements, course eligibility and will even be able to make provisional offers for certain taught postgraduate programmes? Bring the necessary documents including your passport, transcripts, degree certificates and proof of English language proficiency to make the most of your visit! Register in advance. By registering in advance, you are also able to let us know if you need a parking space. On the day we will reserve this for you, making your visit just a bit more hassle free! Get there early. As this is an event that takes place in November, keep in mind that it will get dark quite early. By getting here early you can make the most of your visit and take part in a campus tour while it is still light outside. Get involved in accommodation and campus tours. The campus is a great place to walk around at all times of the year. So do brave the cold, take in all the sights, and get an idea of what accommodation options there are. Speak to people and take notes. This is vital, as there will be students and lecturers from the course(s) you’re interested in. Ask all the questions you may have about the course content and postgraduate student life. From the course structure, scholarships and loan schemes, to how to make the most of your Masters, employability and career services. There will be a lot of information coming your way, so taking some notes and pictures will help you remember the important bits. Make sure you attend the Student Panel at 3.40pm! Students from a variety of different courses (both Masters and PhD), will talk about their experiences at the University of Stirling, as well as answer questions from the audience. Go through all the information you gathered during the Postgraduate Open Day and make a list of things you like and things you are not sure of. If while reviewing your notes you suddenly think of an important question you forgot to ask, or you need more information, do not hesitate to get in touch! Do you want to learn more about the University of Stirling? We’d love to show you around. Register for our next Postgraduate Open Day on Wednesday 27 March from 2:30pm – 6:00pm. Even if you can’t attend Open Day, we’ve got loads of other visiting opportunities you can sign up for. Make sure you share your Open Day snaps using #StirOpenDay!